A pair of French late 19th century giltwood open armchairs (or fauteuils) in the Louis XVI style with original Aubusson tapestry covers in pastel tones. 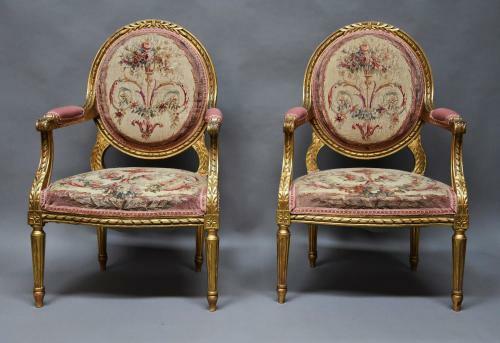 This pair of armchairs consist of carved oval giltwood backs with foliate decoration to the top with original floral and urn Aubusson tapestry covers in good original condition. This leads down to the upholstered armrests with carved scrolling acanthus decoration and shaped and carved arm supports, the seats also comprising of original floral and urn Aubusson tapestry covers, also in good original condition. The giltwood front rails are of serpentine form with floral decoration to either end leading down to carved fluted and tapered legs. This pair of armchairs are in very good original condition for age, are of stable construction and can go straight into a home.